A fragment of Pherecrates’s comedy Chiron, as quoted in Plutarch’s Peri mousikēs, provides insights into aesthetic controversies in ancient Greece. 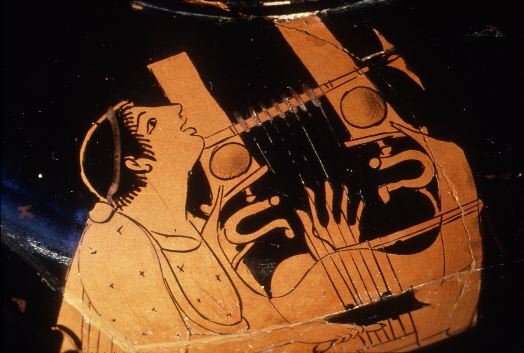 The scene depicts Dame Music as she recounts to Dame Justice the torments she has undergone at the hands of certain musicians of the time: Melanippides seized, debased, and weakened her with 12 tones; Cinesias ruined her with badly composed modulations; Phrynis bent, twisted, and completely destroyed her by sounding all 12 tones on the kithara; and, most egregiously of all, Timotheus, with his shrill dissonances and sinfully high-pitched and piercing notes and whistles, crammed her with modulations just as a cabbage-head is crammed with caterpillars, depriving her of all decency with his 12 tones. This according to “Studies in musical terminology in 5th-century literature” by Ingemar Düring, an essay included in Eranos Löfstedtianus: Opuscula philologica Einaro Löfstedt A.D. XVII kal. iul. anno MCMXLV dedicata (Uppsala : Eranos Förlag, 1945); this Festschrift for the Swedish philologist Einaro Löfstedt (1880–1955) is documented in RILM’s Liber Amicorum: Festschriften for music scholars and nonmusicians, 1840–1966.